This one, in the world of Bowie fans, is a long time coming. 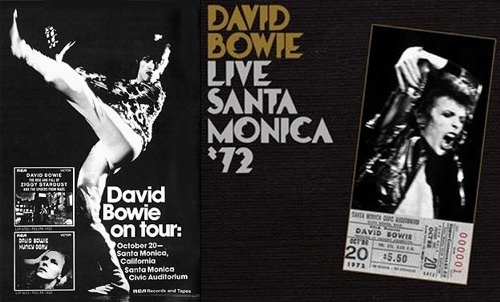 Culled from a local radio (KMET-FM) broadcast, October 20, 1972 in Santa Monica, CA, Bowie’s appearance that night has long been one of the most sought after, and heavily traded, of Bowie bootlegs. I’ve been listening to my old boot copy the past couple weeks, comparing it to this new “official” and “remastered” release (via Virgin/EMI) and the fidelity is audibly improved. Touring behind the Ziggy Stardust album (it was Bowie’s first West coast tour) the set is primarily made up of tracks off Ziggy and its predecessor Hunky Dory with some additional choice Bowie cuts (some unreleased at the time) and covers thrown in. Recently, when asked to reflect on the boot-legged show, Bowie commented “I can tell that I’m totally into being Ziggy by this stage of our touring. It’s no longer an act; I am him. This would be around the tenth American show for us and you can hear that we are all pretty high on ourselves. We train wreck a couple of things, I miss some words and sometimes you wouldn’t know that pianist Mike Garson was onstage with us, but overall I really treasure this bootleg. Mick Ronson is at his blistering best.” Sounds like it. Holy crap, that version of Moonage Daydream JAMS. Thanks, man. Little bit of heaven 94.7, KMET – Tweedle-Dee! That was one heck of a station to grow up with.